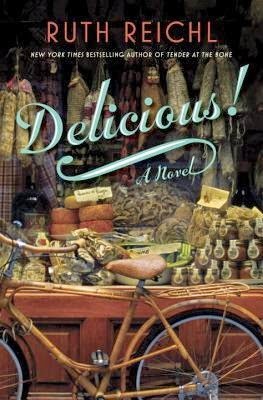 Goodreads: Billie Breslin has traveled far from her California home to take a job at Delicious, the most iconic food magazine in New York and, thus, the world. When the publication is summarily shut down, the colorful staff, who have become an extended family for Billie, must pick up their lives and move on. Not Billie, though. She is offered a new job: staying behind in the magazine's deserted downtown mansion offices to uphold the "Delicious Guarantee"-a public relations hotline for complaints and recipe inquiries-until further notice. What she doesn't know is that this boring, lonely job will be the portal to a life-changing discovery. Delicious! carries the reader to the colorful world of downtown New York restaurateurs and artisanal purveyors, and from the lively food shop in Little Italy where Billie works on weekends to a hidden room in the magazine's library where she discovers the letters of Lulu Swan, a plucky twelve-year-old, who wrote to the legendary chef James Beard during World War II. Lulu's letters lead Billie to a deeper understanding of history (and the history of food), but most important, Lulu's courage in the face of loss inspires Billie to come to terms with her own issues-the panic attacks that occur every time she even thinks about cooking, the truth about the big sister she adored, and her ability to open her heart to love. Kritters Thoughts: Billie Breslin was an easy character to fall in love with and root for and the eccentric characters of Delicious! were just fantastically entertaining! Billie gets a job as an assistant (which was fun to read as that is my job title) to the editor of the magazine Delicious, but she is extremely overqualified as she has taste buds that defy all odds and has a past in the culinary industry. The beginning started a little slow for me as I knew from the synopsis that she was going to find these very old letters and they were going to send her on a treasure hunt, but once she started finding the letters and following their path the book just sped right along! I loved the combination of historical fiction and events mixed with a semi history lesson on food and foods that were used during a time of rationing during the war. I enjoyed reading about the different ways they grew their own food or acquired food or substituted food to make meals. Part historical fiction, part literary fiction and all in all a great book! I want to read this one. I like the Historical Fiction aspect too.